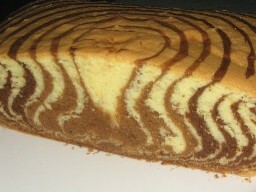 I was supposed to make Marble Cake instead of the cookies last Monday. So yesterday, since my DH's frens were coming over, I decided why not bake it. And I did. I got back from work, wash up and stuff and then started to make the cake. I found this recipe from my mum's cook jotterbook. Apparently she got it from somewhere else but do not really know who the originator was. After the cake has been sliced .. Grease a tin with softened butter. Melt butter and leave to cool. Combine sugar, eggs and ovalette and flour and beat for about 10 mins. Put in vanilla essence and gradually pour in the melted butter whilst continue beating the mixture. Put half the mixture into another bowl. Mix in the chocolate emulco and cocoa powder. To assemble put 3 tablespoons of the white mixture then 3 tablespoons of choc mixture over the white one. When you have used half of the mixture reduce to 2 tablespoons then reduce to 1 tablespoon. Bake for 40 mins or until cooked. Allow cake to cool in the tin for abt 10 mins before turning it out to cool on a wire tray. the chocolate emulco can change to cocoa powder? Then i don't quite understand the assemble. Just letak 3 tablespoon white one and another 3 tablespoon chocolate ones on top ke? the emulco is in addition to the cocoa powder. it doesnt hurt u may do away with the emulco. as for the assembling of the cake. u first put 3 tbsp of the white one in the middle of your baking tin. note that u do not need to spread the mixture as it will spread by itself when u put 3 tbsp of cocoa mixture and place it on top of the white one. kira mcm berlapis2 lah. m3rni3 please help me! I tried baking this chocolate marble cake from another recipe which is pretty similar but my cake doesnt rise up to the brim of my loaf tin. height of the cake turned out to be only 2cm. An I supposed to use self-raising flour or plain flour? Is these measurements of ingredients for a cake tin size cake or loaf tin?